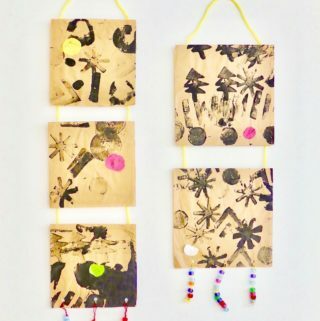 Tape-resist is a simple and fun process art technique for young children. 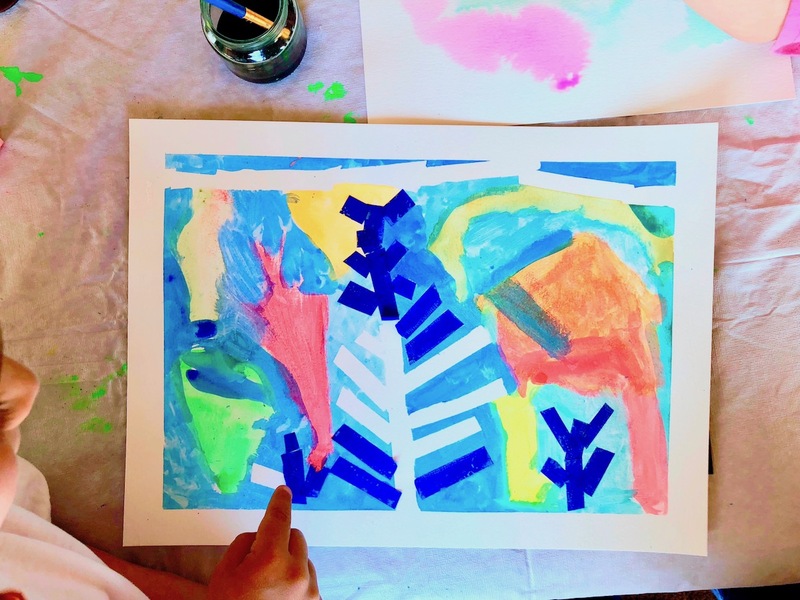 You can create any design, make open-ended abstract masterpieces or create to a topic like we did. Go on nature walks, look for and draw your children’s attention to the changing seasons. Talk about how the weather and the plants change throughout the year. Encourage the children to look at flowers closely, notice the different colors, shapes, and textures. Ask questions like “Are all flowers the same?”, “Do all flowers have a center?”, “What do you notice about the shapes and the petals?” and “What does a flower need to live?”. Take magnifying glasses and drawing board outside. Sketch flowers, smell flowers, pick flowers, plant flowers, press flowers – discover with all your senses! 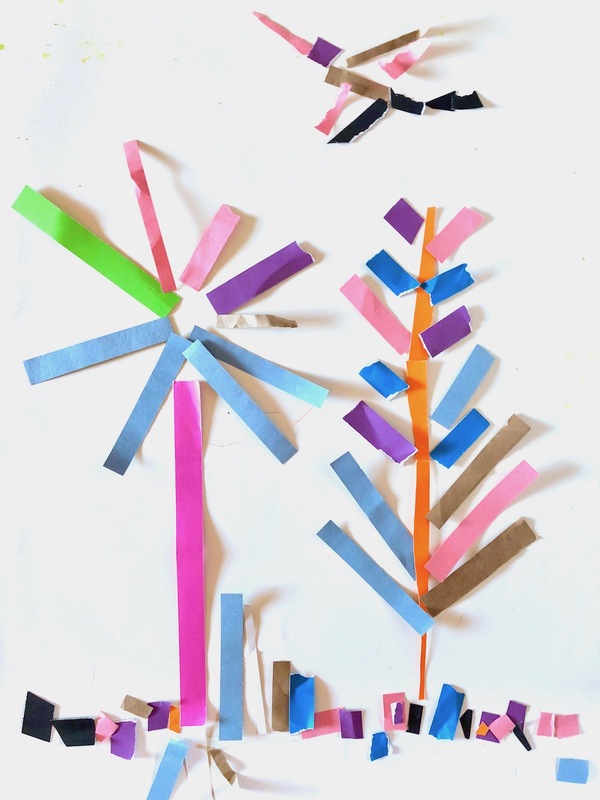 To introduce the concept of creating with tape, prepare a few colored strips of paper. 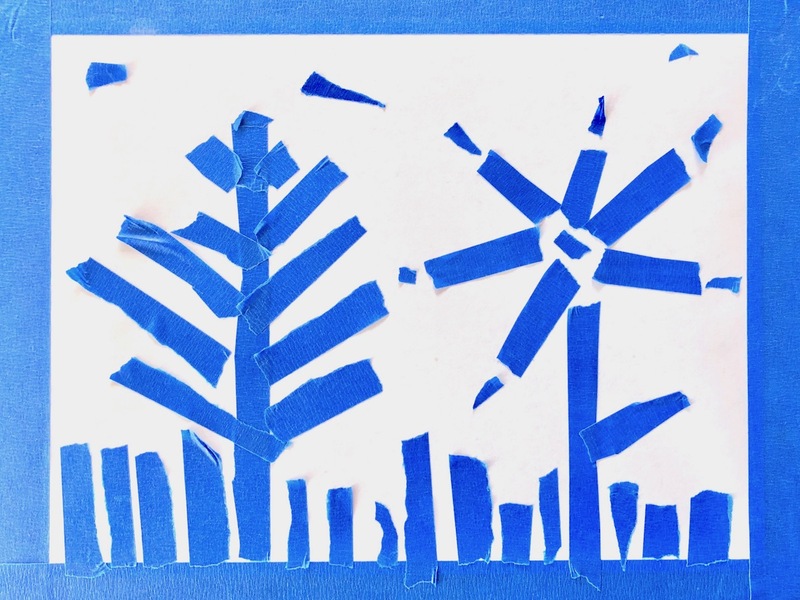 Gather the children around a white paper, pick a interesting spring flower and see if you can make a flower with just strips of paper. Take turns adding to the flower. 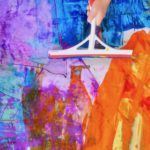 Are you ready to do that with tape on your own paper? Are you going to make a flower or something else? Rip or cut small pieces of tape and stick it on the table if you’re working with children who are too young to cut it themselves. 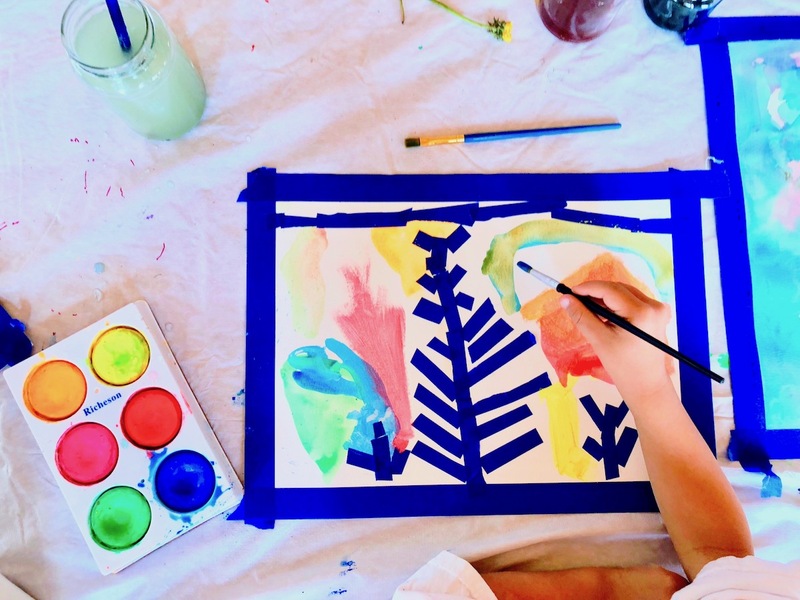 Invite the children to closely look at their flowers before they place the tape on their watercolor paper. 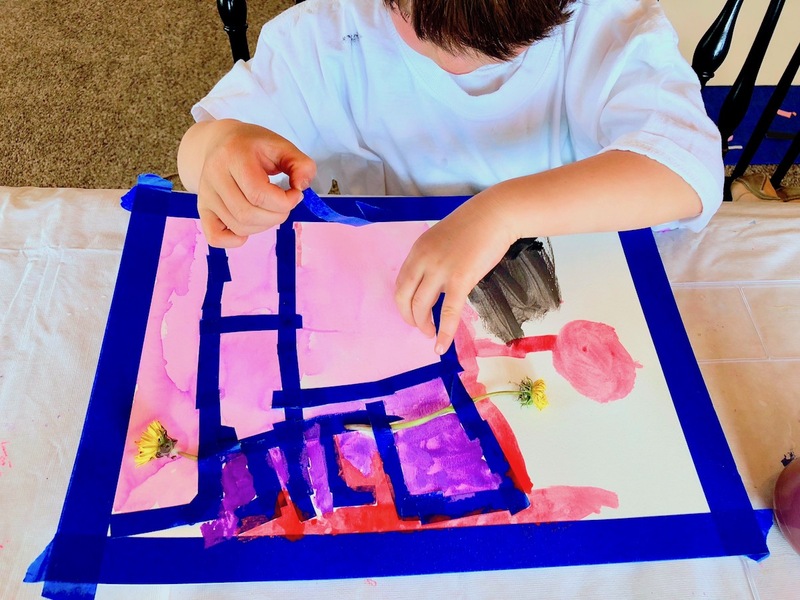 Leave the process up to the children: Some of the children really looked closely at the lines and structure of a flower and tried to create it with tape while others wanted to make a whole meadow or just had fun placing the tape randomly. Painting might have been the most fun part of this project. 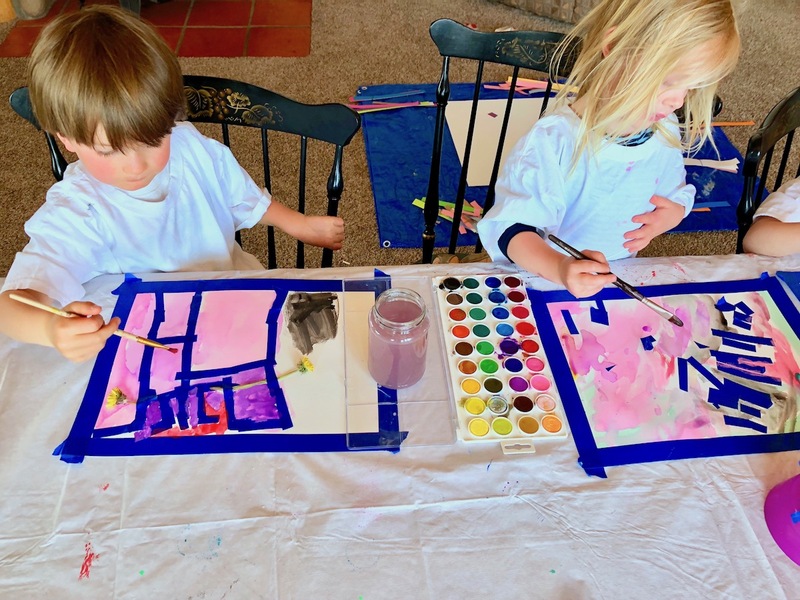 When your children are happy with their design set out the watercolors. 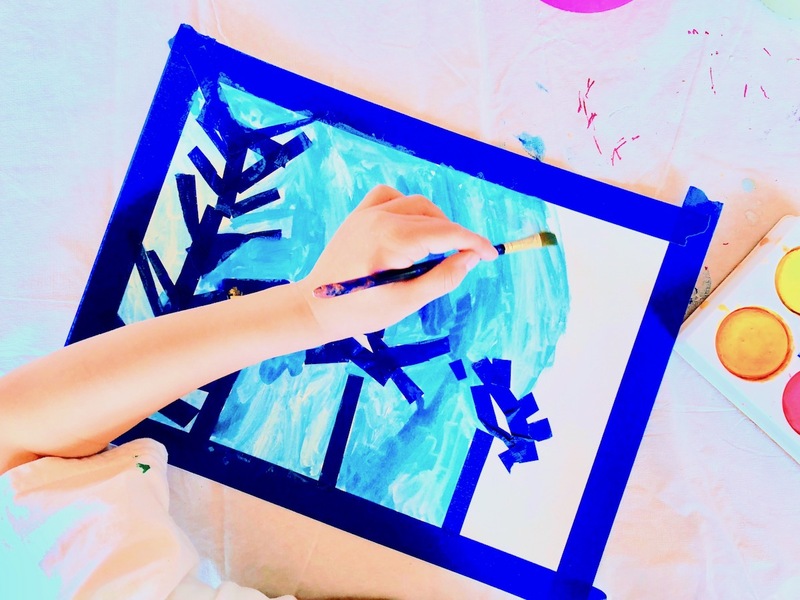 Make sure the children understand that we’ll paint right over the tape and peel it off after painting. Areas under the tape will remain white. 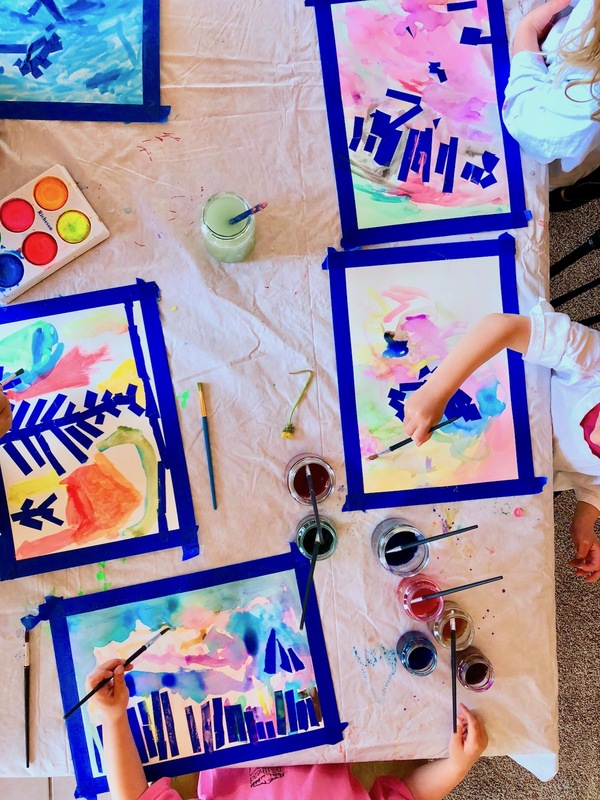 Mix some water with just a few drops of liquid watercolors until you like the hue and intensity of the color and add a thick paintbrush to each glass. 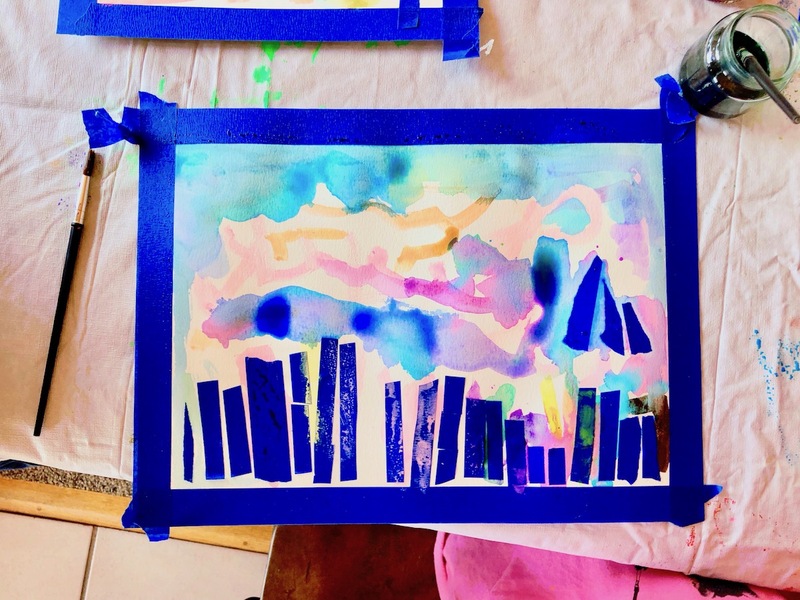 I usually tell the children to use one color at a time and ask them to put the paintbrush back in it’s glass which keeps the colors clean and vibrant. 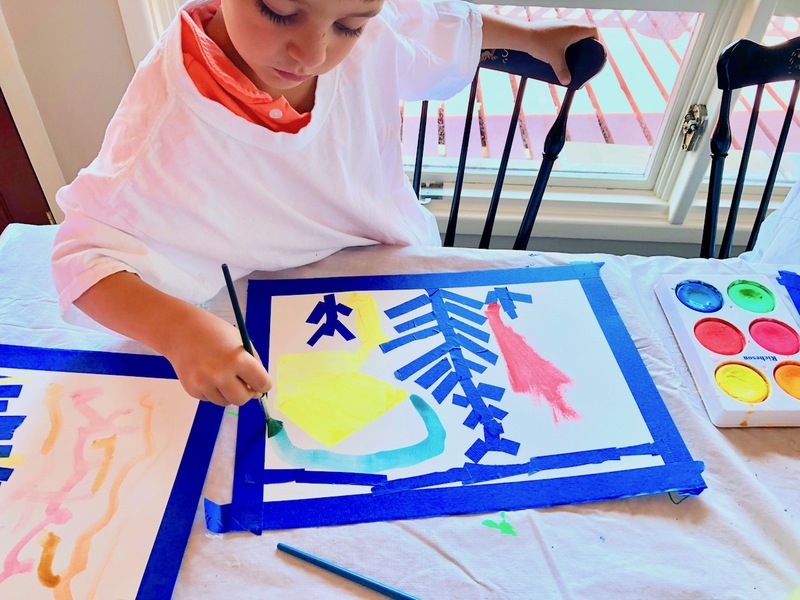 I also encourage color mixing but remind the children to watch how their colors mix in order to minimize muddy colors unless they really want to create brown. 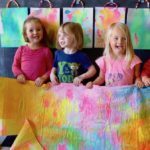 While painting simply observe, comment and ask questions about what the children are doing. Focus on the process, the experience and the exploration of the materials rather than the finished product. 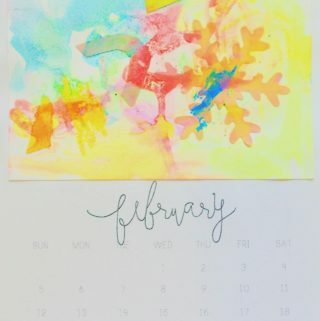 Point out how the colors mix, how the paper soaks up the watercolors. Ask things like “I wonder what color you will use next?”, or “I wonder what would happen if you mix two colors?”, or “Which colors did you use to create this color?”. Leave no white and make sure to color your whole paper. 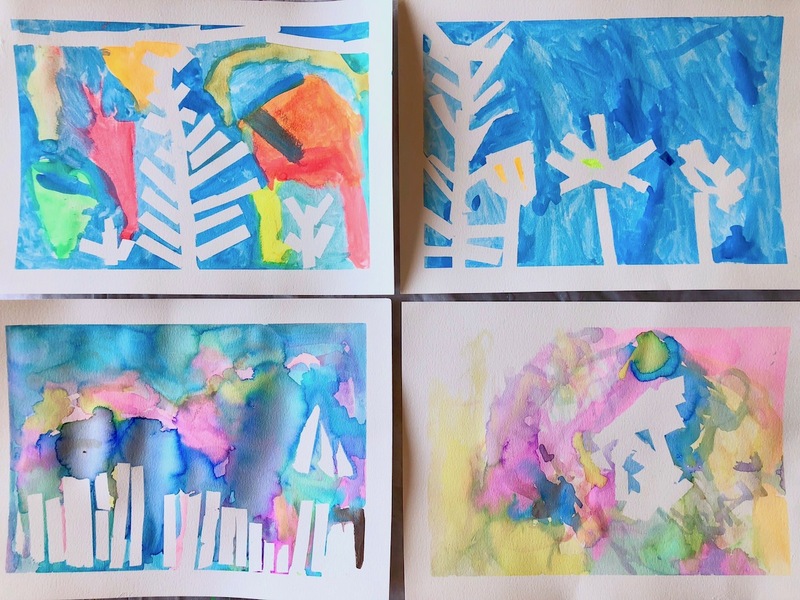 If you want to add texture and sparkles offer the children to sprinkle a little salt in the wet watercolor puddles. 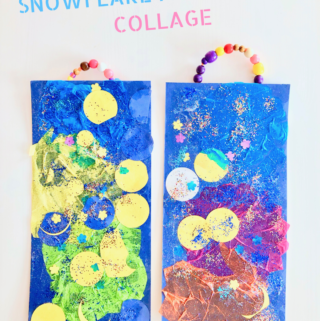 We love the effect of the sparkly crystals that form! 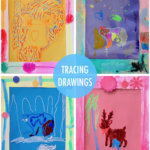 Once the paper dried a little, carefully lift off the tape and reveal your design. This is always fun and such a surprise and usually prompts lots of “wow’s, oh’s and ah’s”! 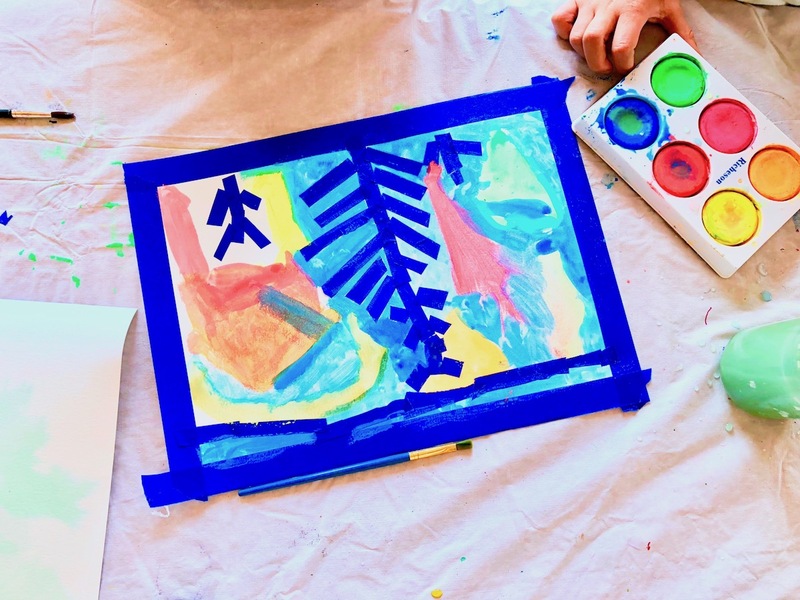 Abstract tape-resist with watercolors and oil pastels, perfect for your toddler (you could use canvas or create on triptychon paper panels). Many variations of tape-resist painting here (I especially love the added details and patterns with Sharpies). Big landscapes with tempera paint. 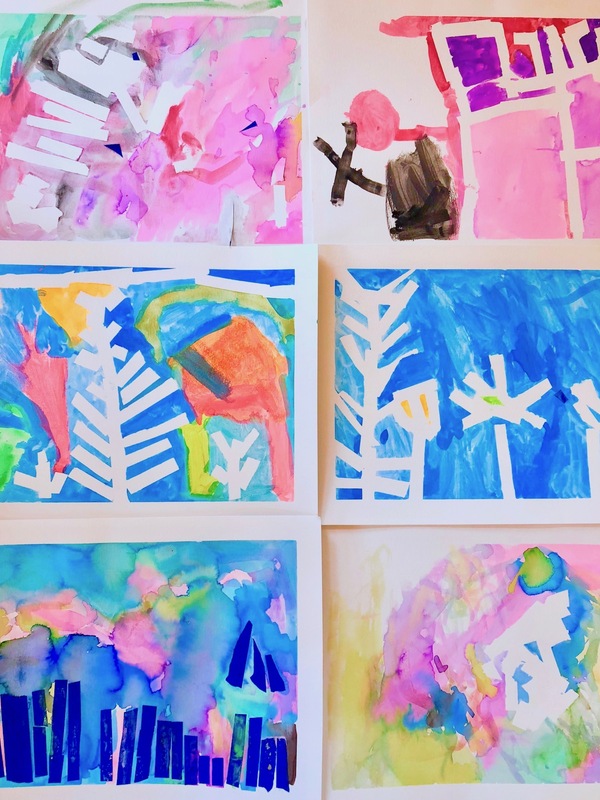 Beautiful watercolor trees older children might like as well (wet your paper with a sponge before coloring). 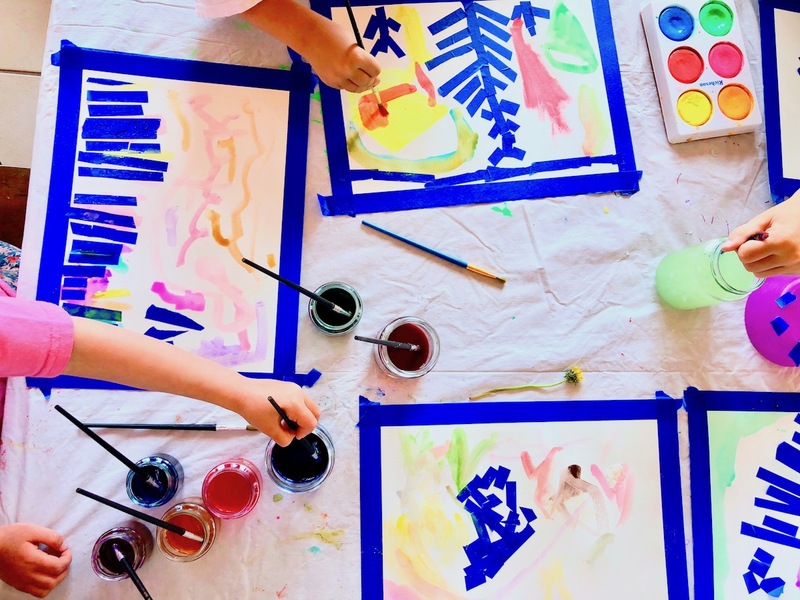 And how about switching to tape-resist painting with spray bottles, sponges or finger-painting?